Keratin is a protein that adds strength to hair, nails and the outer layer of skin. Even though it isn't found in food, eating the right foods -- those rich in protein and certain vitamins -- can boost keratin production and support hair, skin and nail growth. Amino acids are the building blocks for proteins like keratin, which is made up of sulfur-rich amino acids that bond together to form strong chains. Foods high in protein -- like meat, beans and eggs -- are good sources of dietary sulfur. It can also be found in some vegetables like onions, kale, asparagus and brussels sprouts. Eating foods high in protein gives the body the amino acids it needs to make keratin. Red meat, fish, chicken, pork, eggs, milk and yogurt are all protein-rich. The best plant sources of protein include beans, nuts, nut butters and quinoa. Most adults need two to three servings of protein each day to meet their daily requirements. Biotin is needed to metabolize the amino acids that create keratin and is generally recommended to strengthen hair and nails. Dietary sources of biotin include nuts, beans, whole grains, cauliflower and mushrooms. 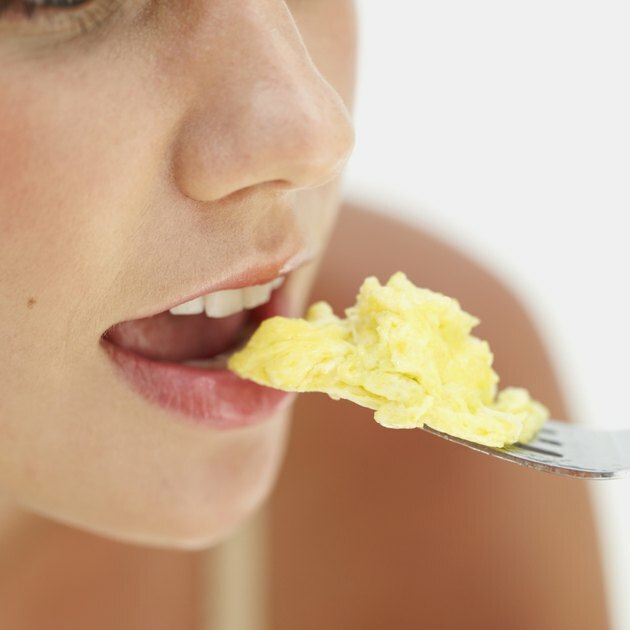 It can also be found in cooked egg yolks, but raw egg whites have a protein that interferes with biotin absorption. Because biotin is water-soluble, it's not stored in the body and can be lost in cooking methods that put it in direct contact with water, like boiling. Vitamin A is needed for keratin synthesis. Good dietary sources of vitamin A include many orange fruits and vegetables like pumpkin, sweet potatoes, butternut squash, raw carrots and cantaloupe. Cooked greens like spinach, kale and collards are also high in vitamin A. Vitamin A is fat-soluble, so it can only be absorbed when eaten with a fat source. This also means that excess dietary intake of vitamin A is stored in the body.